Texas Governor Greg Abbott signed a bill into law last weekend that prevents Texas pastors’ sermons from being subpoenaed. 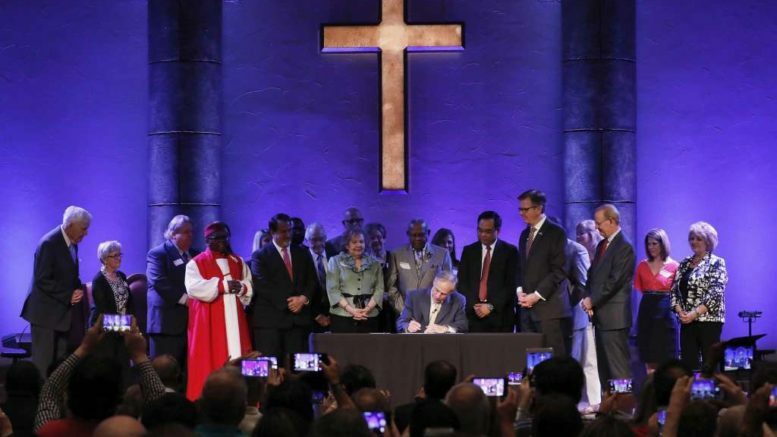 Abbott signed Senate Bill 24, also known the Sermon Safeguard Bill, during a special ceremony at Grace Community Church in The Woodlands, Texas. The bill was sparked by a 2014 controversy over a non-discrimination ordinance in Houston, Texas. During the battle surrounding the ordinance, Houston Mayor Annise Parker subpoenaed the sermons of five Houston pastors who opposed it. The Sermon Safeguard bill was sponsored by State Senator Joan Huffman, who represents Houston, and was pushed by Lieutenant Governor Dan Patrick. Under the new law, which went into effect Friday, Texas state and local governments cannot issue subpoenas for religious sermons. Religious leaders such as pastors also cannot be forced to testify about the content of their sermons.